A little sibling teasing can be fun no matter your ages. This birthday card does just that while wishing your brother all the best life has to offer in the coming year. 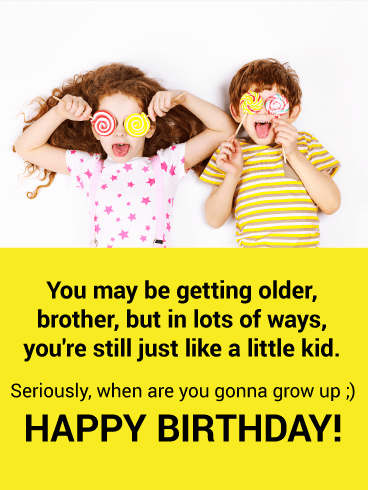 He’s the best sibling you could have, and you should tell him that with this birthday card. With a drink in one paw and a mic in the other, this pooch is ready to help your brother celebrate his birthday in a big way! 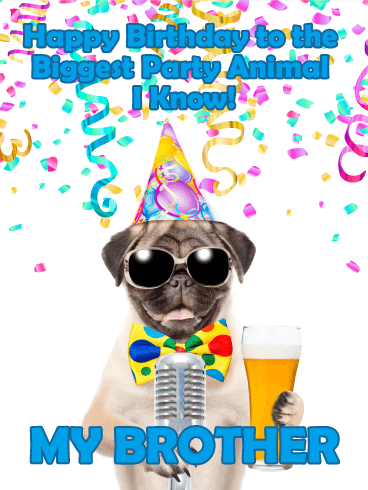 This funny card is perfect for the party animal of the family, and is guaranteed to bring lots of howling laughter and happiness, no matter how old he's turning this year. 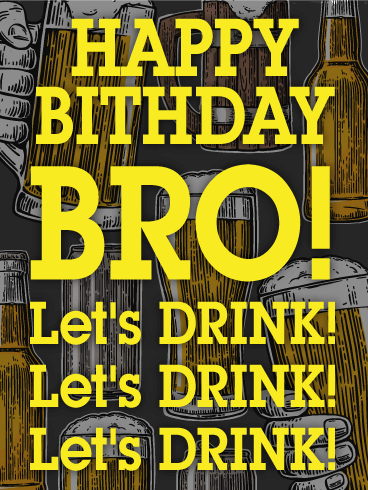 For any bro who loves a nice cold brew, this funny birthday card is sure to hit the spot! Brightly lit candles top a frosty beer mug, helping to wish your awesome brother the best day ever, filled with lots of toasting and celebrating with his beverage of choice! Style. Class. Looks. Personality. 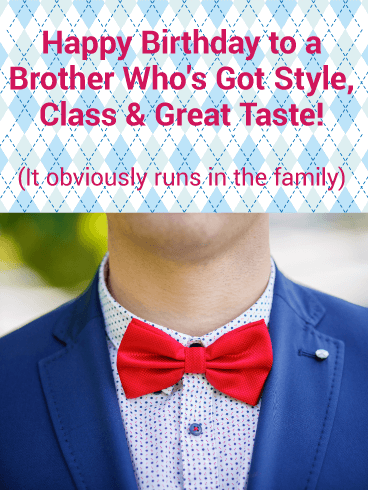 Your brother's got it all. And it's obviously because he's related to you! 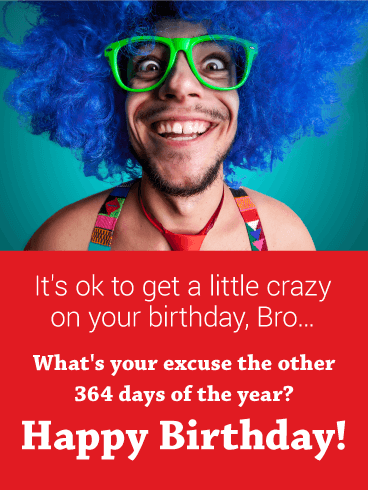 Wish him a happy birthday with this playful, witty funny birthday card, which will remind him how much he has going for him...even if he is getting older! These little cuties capture the carefree spirit of childhood. 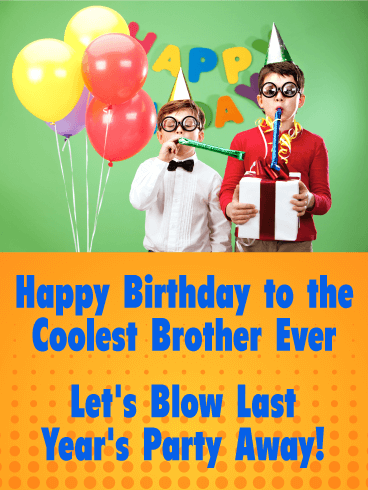 Sometimes those qualities stay with us into adulthood, and there's no better time to remind your brother than on his birthday! With a playful humor, this birthday card will bring a smile to his face while letting him know you love him, no matter how old he acts! They may not look like the coolest kids around, but these party goers definitely know how to have some fun. 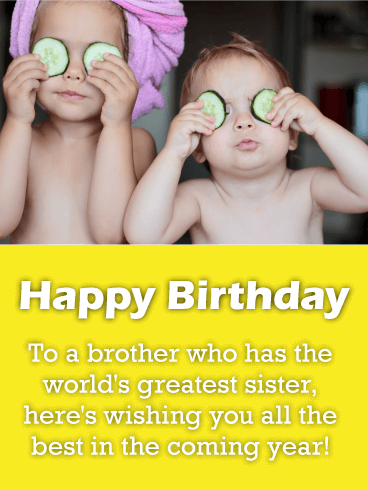 This cute birthday card will let your brother know that he's got a lot to celebrate this year...especially because you're right there by his side, wishing him the happiest birthday ever! You shared a lot growing up, including your sometimes corny sense of humor. 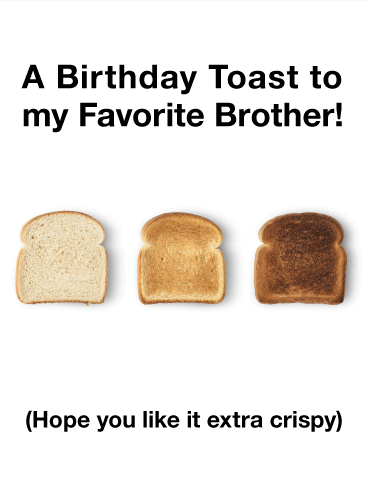 That's why this funny (and punny) birthday card is the perfect pick for your brother! He's sure to appreciate the gesture while getting a few laughs in knowing it came from you! Take a sneak peek at the future. 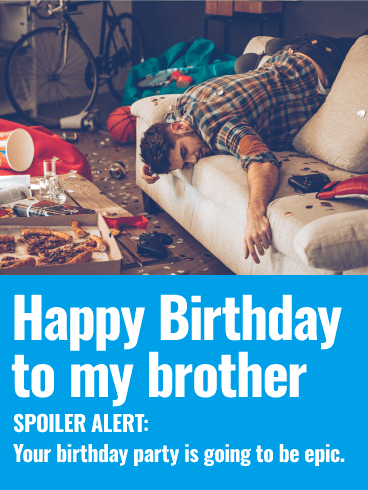 The day after your brother's birthday! This funny birthday card doesn't beat around the bush. Your brother is gonna party. He's gonna party hard. The next day won't be pretty, but that's OK because the night was epic! Who is to say what happens between the first game of beer pong and the last shot of tequila? Only he can say. 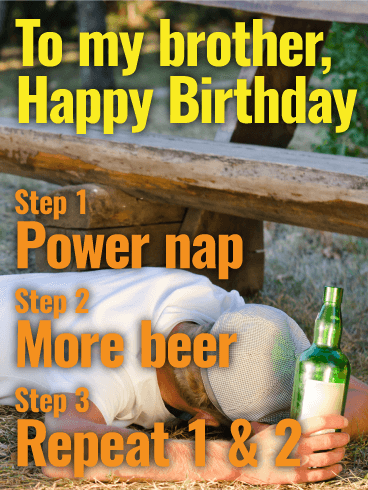 Send this humorous birthday card to your brother today. It's just a power nap! 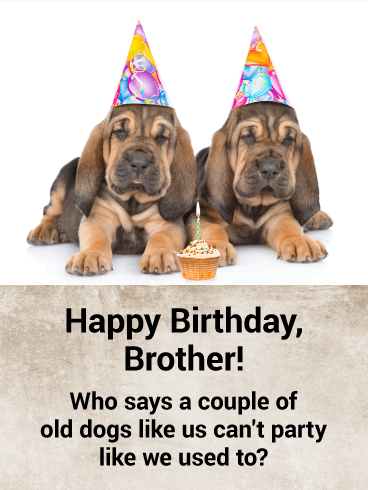 Send a funny birthday card to your brother on his birthday. 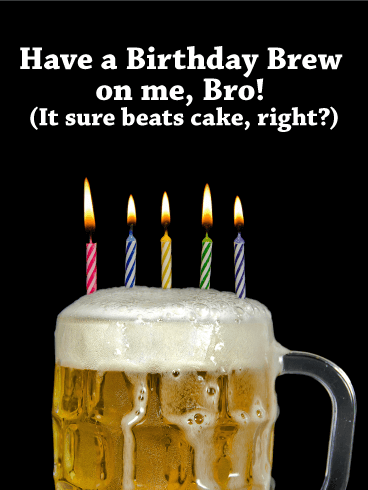 This humorous birthday message reminds him to keep his strength up for all the beer drinking he is about to do. 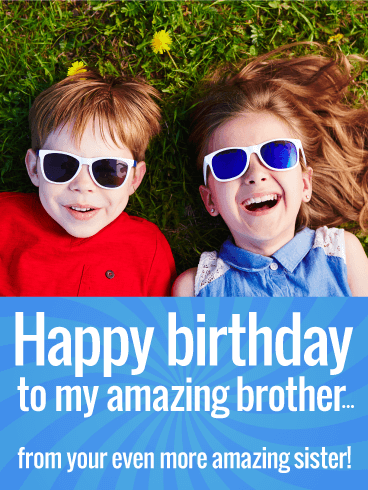 Celebrate your brother's birthday with a little wit and humor and send him this fun birthday greeting today. Nap, beer, repeat! That's what birthdays are all about.